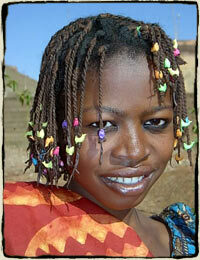 Sanaba is about 14 and of Bamanan origins originally from Segou. She has two brothers and a little sister and it is with her family that her cousin Fatoumata (see above) lives as well. While her father is a stone mason he is mostly unemployed due to lack of work and her mother has always been a beggar. Begging hardly brought in enough to feed anyone and many times the whole family would go hungry. Sanaba thought she would have to depend on begging her entire life and did not like the idea of going hungry so often. She has emerged as a very talented fabric dyer and leads in creating the beautiful colors of the products. She will join a team of three others to form her own business.